required - pay the rest off in instalments. High quality 3 & 4* hotel accommodation with free WiFi. Spend 5 days exploring the untamed beauty of Cambodia. Start in phenomenal Phnom Penh and experience the most iconic sights, like the Royal Palace, Silver Pagoda and Wat Phnom temple. Reflect on Cambodia's recent history of brutality as you visit the Tuol Sleng Genocide Museums and killing fields. Experience the best of the floating villages of Cong Kneas on board a traditional wooden boat, just like a local. Here the rhythm of life has remained unchanged. 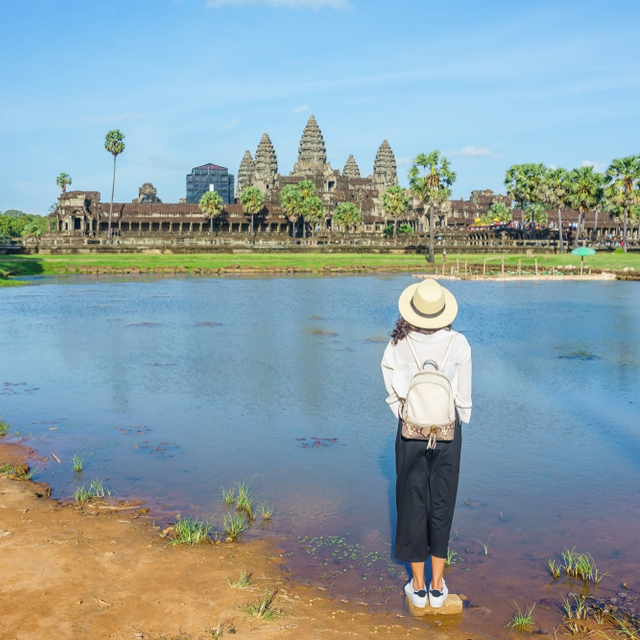 Take a day to saunter about Angkor Wat, one of Cambodia's most renowned ancient Hindu temples. Ready, set, Cambodia! This is an experience that will leave you forever changed. The tour starts in the city of Phnom Penh today. 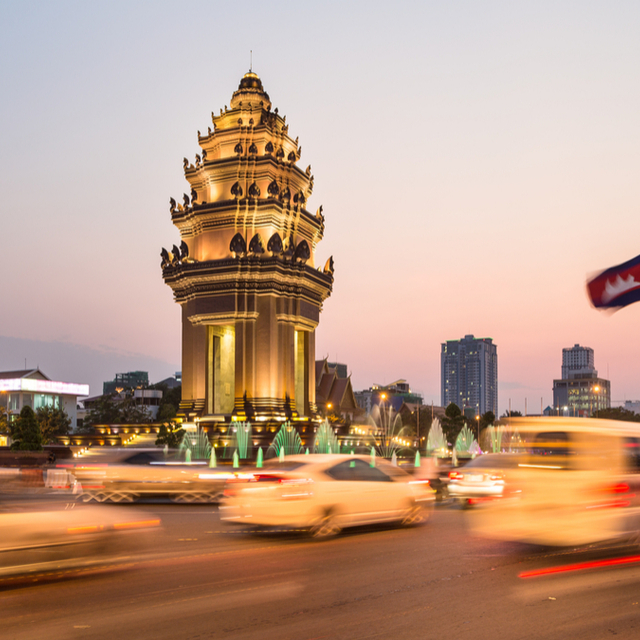 Check in at your hotel and take to the streets to drink in the vibrant bustle of the Cambodian capital. Make your way to a roadside cafe to watch the world go by, or simply walk around and find your way. Meet up with your tour leader at the hotel this evening. If you have some free time before meeting your group at the hotel, take a walk through the city. 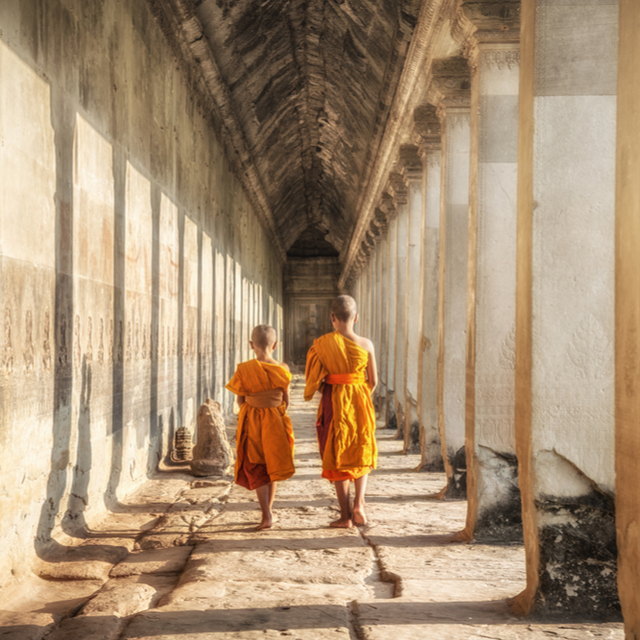 Top sights include the Cambodian Landmine Museum, Angkor Silk Farm and the Wat Thmei monastery. Start with a visit to the Tuol Sleng Genocide Museum. Once a former school, it was later used to hold many prisoners captive and torture them under the merciless Khmer Rouge regime. Follow in their footsteps as you make your way to the Killing Fields (Choeung Ek Extermination Camp). 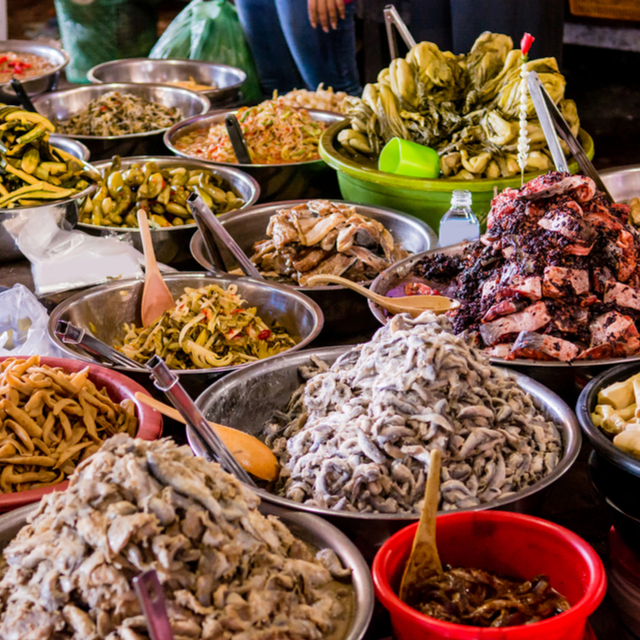 After a morning of dark, light and humbling experiences, make your way to the bustling Toul Tom Poung Market. Here, you can shop for souvenirs and keepsakes. Then it's onto the Royal Compound, where you can encounter the famous Royal Palace and Silver Pagoda. Round it all off with a visit to the Wat Phnom that perches atop a hill. Tuol Sleng Genocide Museum (S-21 prison). The security forces of the Khmer Rouge, under the instruction of Pol Pot, kept countless prisoners captive at the infamous S-21 prison. 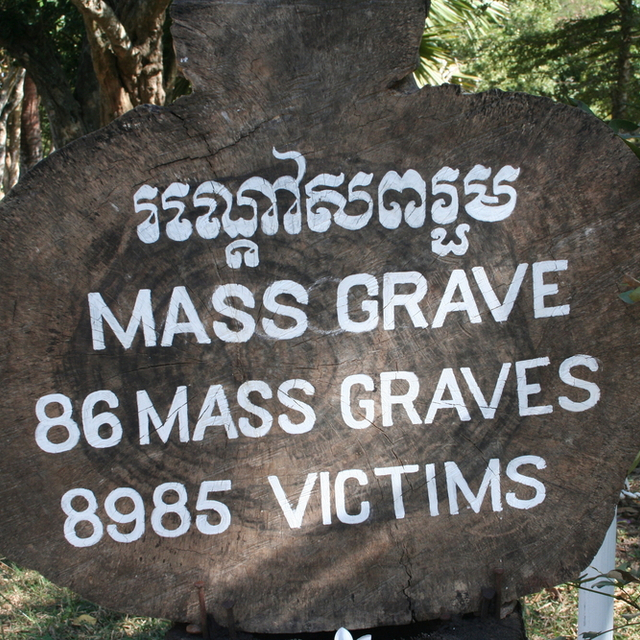 The Killing Fields of Choeung Ek. In the horrific period between 1975 and 1978, more than 17,000 prisoners were executed at Choeung Ek after being detained at the S-21 prison. This included me, women and children who were kept as political prisoners of the Khmer Rouge. Toul Tom Poung Market. This bustling market is also referred to as the Russian Market because it was favoured by Russian expats in the 1980s. Today it’s a great spot to pick up some travel bargains. Royal Palace. 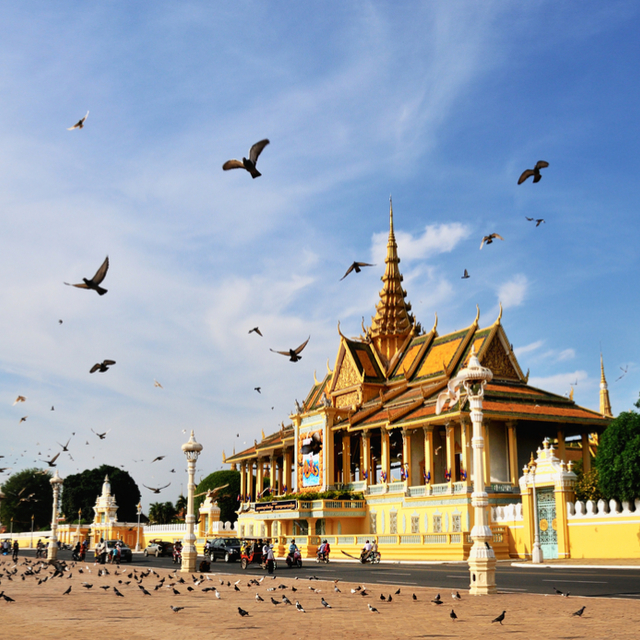 The Royal Palace is a complex of structures that serve as the home of the king of Cambodia. There are many wonderful things to see in the area that is passable to the public. This includes the Silver Pagoda, where the king meets with the monks. Wat Phnom Temple. Constructed in the late-1300s, the beautiful Wat Phnom temple is situated atop a tree-lined knoll just shy of 30m high. 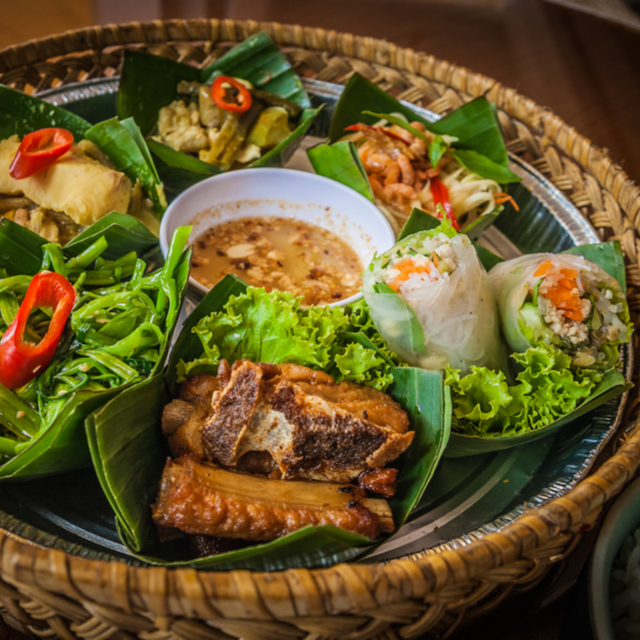 Enjoy a local breakfast and make your way to Siem Reap. This resort town serves as the gateway to the famous ruins of Angkor. 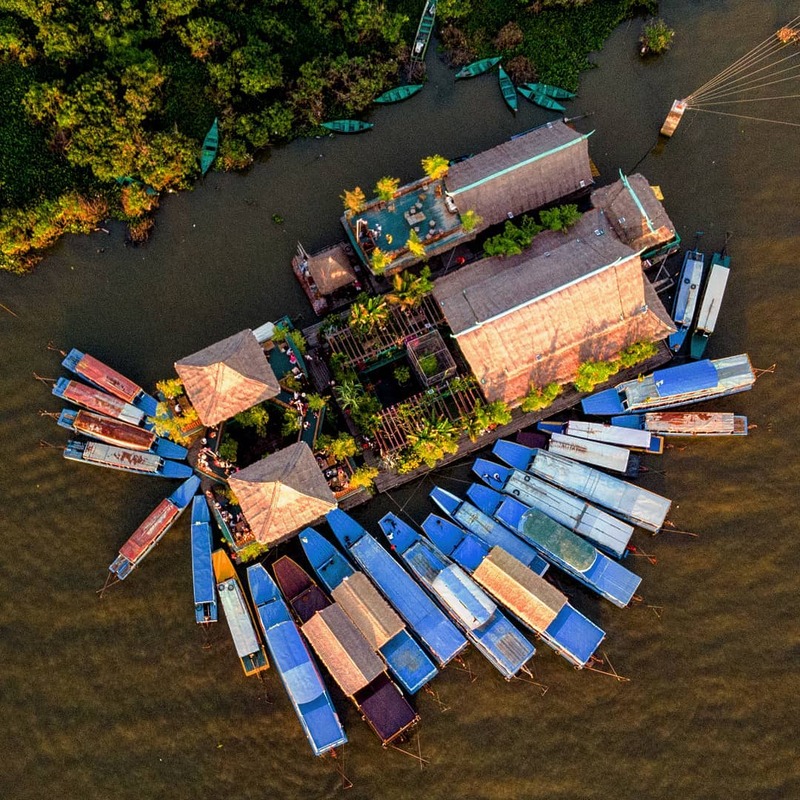 Check in at the hotel and kick off with a visit to the friendly and colourful floating village of Chong Kneas. Explore Tonle Sap Lake on a traditional wooden boat, just like a local. Spend the rest of the day at Chantiers Ecoles - Les Artisans d'Angkor. 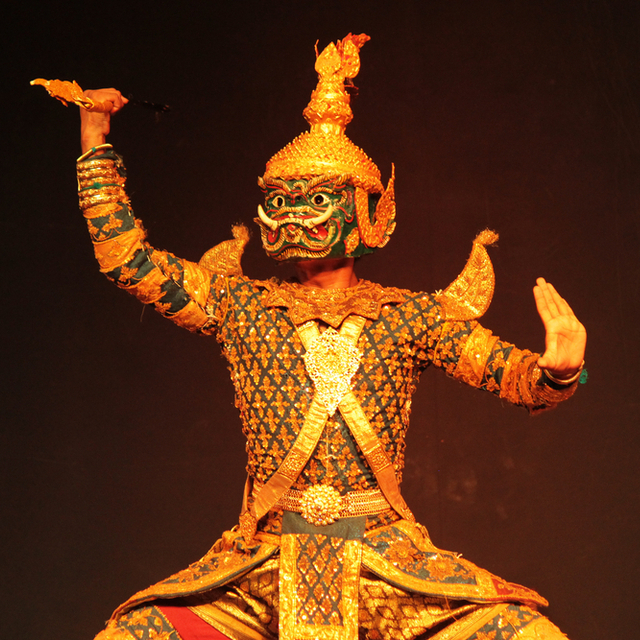 Here you can observe how young Cambodians train in the age-old traditions of the Khmer culture. Chong Kneas floating village. This is a unique shopping experience if ever there was one. 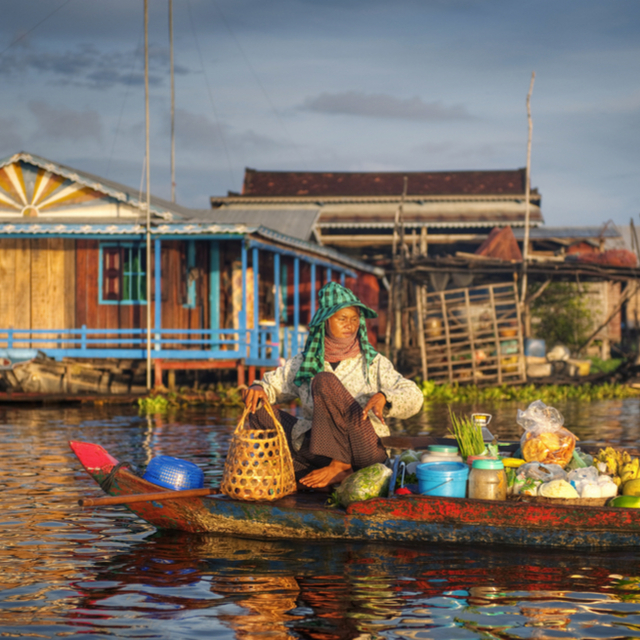 Take a traditional wooden vessel to the central market of the floating village on Tonle Sap Lake. Chantiers Ecoles - Les Artisans d'Angkor. This social business is instrumental in creating job opportunities for young people from rural communities. They are taught traditional wood- and stone carving, silk painting, lacquerware and other artisanal skills. Angkor Wat is a symbol of Cambodia and one of the country's most popular travel attractions. This UNESCO World Heritage Site is the largest monument of its kind in the world. The Angkor temple complex covers over 400 km2 (including the forested area). It's home to the remains of the different capitals of the Khmer Empire. 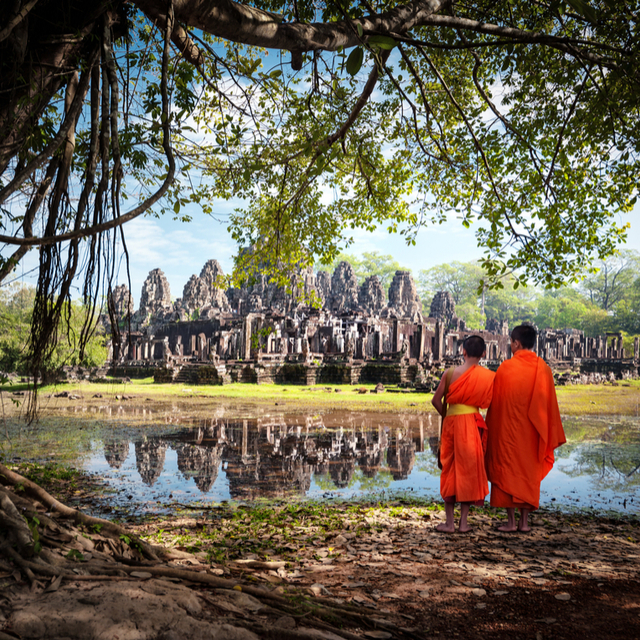 Take the day to explore the sights, which include the Bayon Temple, Royal Enclosure and more. Angkor Wat. A visit to Cambodia is not complete without a foray to mystical Angkor - the erstwhile seat of the vast Khmer Kingdom. 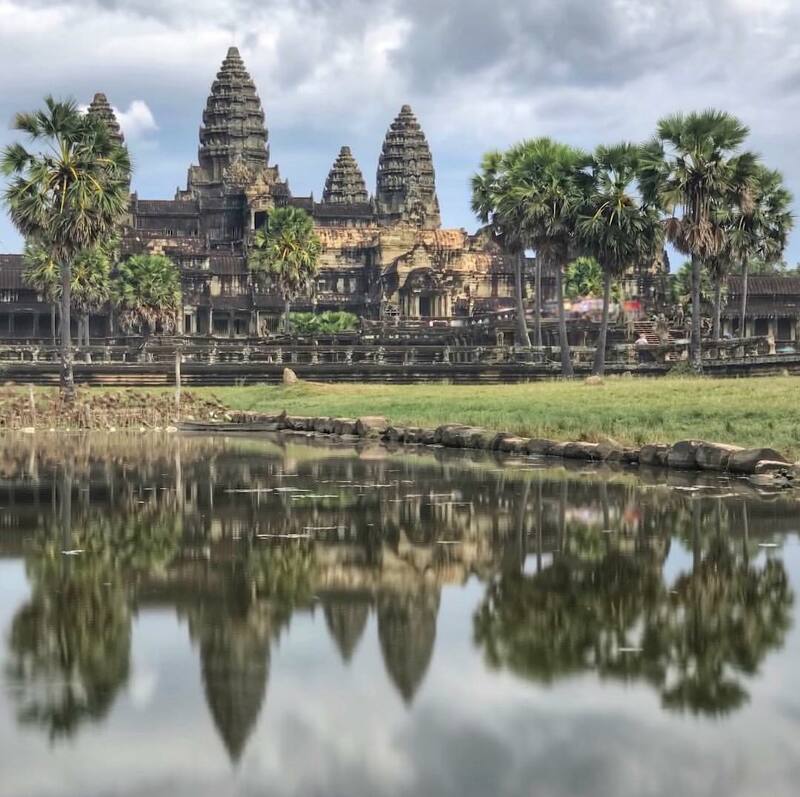 What remains of the dynasty today are spectacular monuments like the well-preserved Angkor Wat temple which has stood here for no less than 9 centuries. 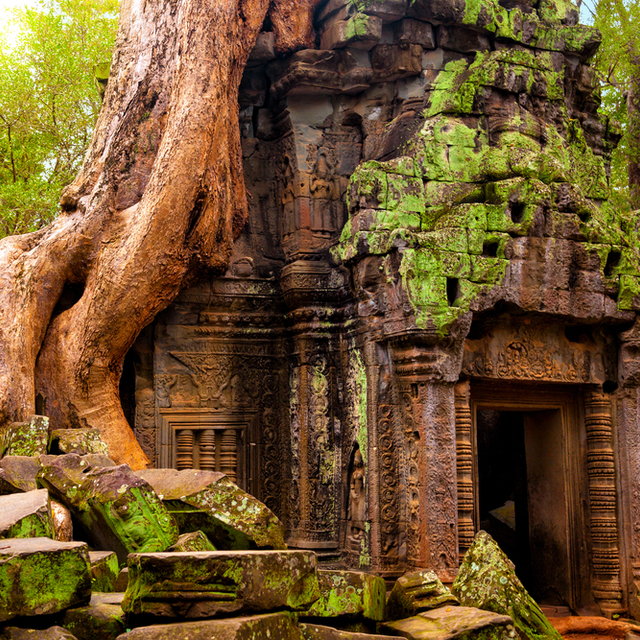 The Ta Prohm temple is another wonderful site - covered by huge creepers and ancient fig trees, this temple plays testament to the unstoppable forces of nature. Your Cambodian tour has come to an end. Take some time to exchange contact details with your fellow travellers so you can keep in touch afterward. This is the last day of your tour in Cambodia. Please check out at the hotel by 10:00 hrs. There is still plenty of Siem Reap left to explore if you have some time before your flight leaves. We hope to welcome you back on another Expat Explore tour soon. In the meantime, remember to tag #ExpatExplore if you choose to share memories of your trip online. 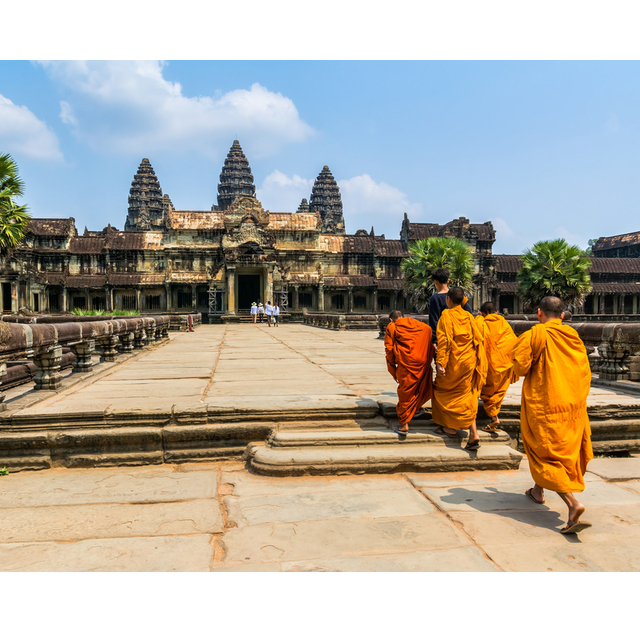 Certain nationalities may require a Cambodian visa for this tour. Please see our pre-departure information for more details. It is your responsibility to contact the relevant embassy to confirm your visa requirements. We can provide support documentation upon request, please contact us for more information. 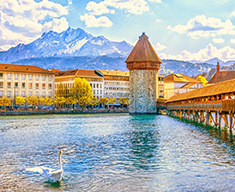 Please refer to the tour itinerary for full details of the activities and meals that are included in the tour cost, and those that are optional/extra. 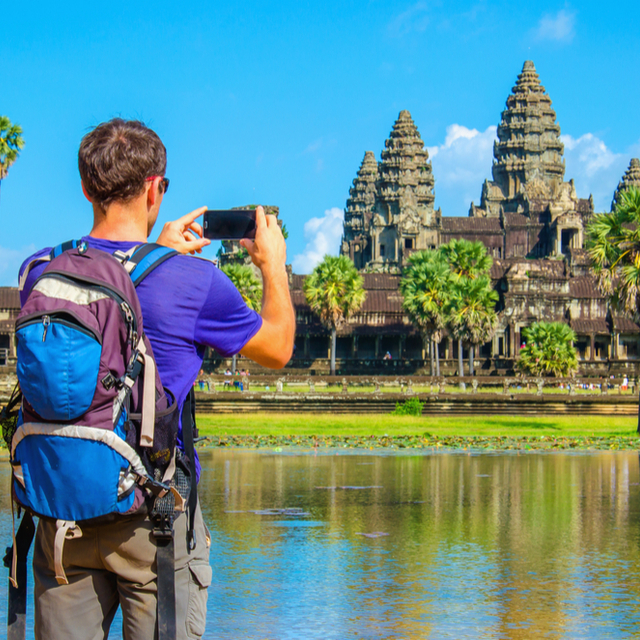 We would recommend budgeting 60,00-100,000 Cambodian riel / 15-25 USD per day (this excludes optional excursions). In some destinations you will have some free time, where you can choose to join our optional excursions or explore on your own. 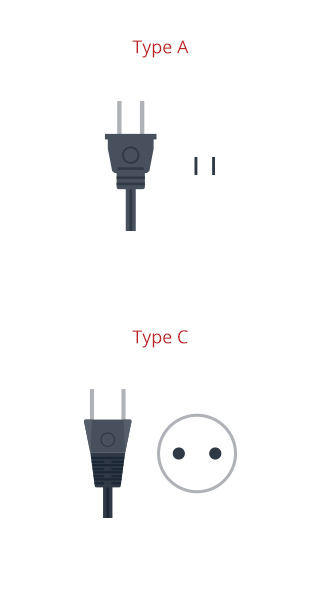 Socket A requires plug type A. Socket C requires plug type C. A travel multi-adapter that includes plug types A and C will allow you to use all socket types encountered on this tour. Your tour starts in Phnom Penh, Cambodia and finishes in Siem Reap, Cambodia. Please have a look at our essential tour information page for detailed information.